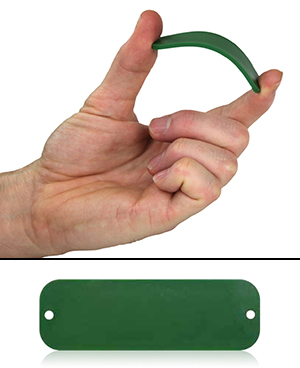 HID Global unveiled a new, high performance, UHF RFID tag with flexible yet durable encasement for harsh environments. Thanks to its waterproof and robust, yet flexible construction, the HID Global SlimFlex Tag Standard is a UHF RFID tag ideally suited to tagging rounded or irregular surfaces, providing long read ranges and high resistance to aggressive chemicals and rough handling at the same time. The SlimFlex Tag Standard is tuned to work reliably across the entire frequency spectrum of the EPC Gen 2 standard (860-960 MHz), and is optimized for non-metal surfaces with read ranges up to 6m. Typical applications of this flexible UHF RFID tag include: tracking of pipes and other curved surfaces, wooden pallets, plastic containers, safety equipment tagging such as helmets and boots, living trees and many other non-metal assets. Standard color is green but alternate colors are available. HID Global can deliver the product with custom embossed logo upon customer request. The SlimFlex Tag Standard comes with 2-year warranty. Please go to the VeryFields Database for more info on this product.